The Electrician finds it entertaining to shop with me because I have an odd seventh sense about prices and deals. Somehow, I just get a tingling about where to go when I need to buy a particular item. For example, when I bought the dollhouse, I envisioned an ivory leather sectional in my livingroom. The couches I liked started well beyond my budget, unfortunately. On a random Thursday, I had a funny feeling about Urban Barn. Urban Barn furniture is stunning: it’s well made: it’s bloody expensive. The first thing I saw when I walked in the door was the sectional of my dreams, smooth, buttery ivory leather with sleek lines. The second thing I saw was the price tag. My jaw hit the floor. My dream sofa was marked down from $3300 to $1999. Apparently, the new floor model had arrived in the store just as the company discontinued the sectional. Urban Barn was unloading the couch, brand new and perfect, at a slashed price to get rid of it because it couldn’t be ordered any more. I bought it and had it wrapped up. I should mention here that I didn’t yet actually have possession of the dollhouse, so my sectional lived in pieces in my walk-up apartment for three weeks. A good bargain waits for no one. I outdid myself this weekend. Before my Sunday deep-water aquasize class, I popped over to Stupidstore to grab the stuff I needed for lunches and suppers for the next little bit. The last place I stopped was the fresh meats. I wanted to make some chicken and rice to cook up in tasty ways and freeze for school lunches. I definitely prefer dark meat to white, and I spend a lot of money on chicken thighs. I try to buy meats in large packages as much as I can because the prices are generally much better. I shuffled through the big trays of boneless skinless chicken thighs, looking for the leanest thighs with the latest expiration date. Most of the packages ranged from nineteen to twenty two dollars. Chicken isn’t cheap. In Canada, it’s the store’s responsibility to ensure correct labeling on its products. A Stupidstore employee apparently mislabeled this package, but due to Canadian retail law, the price stands. 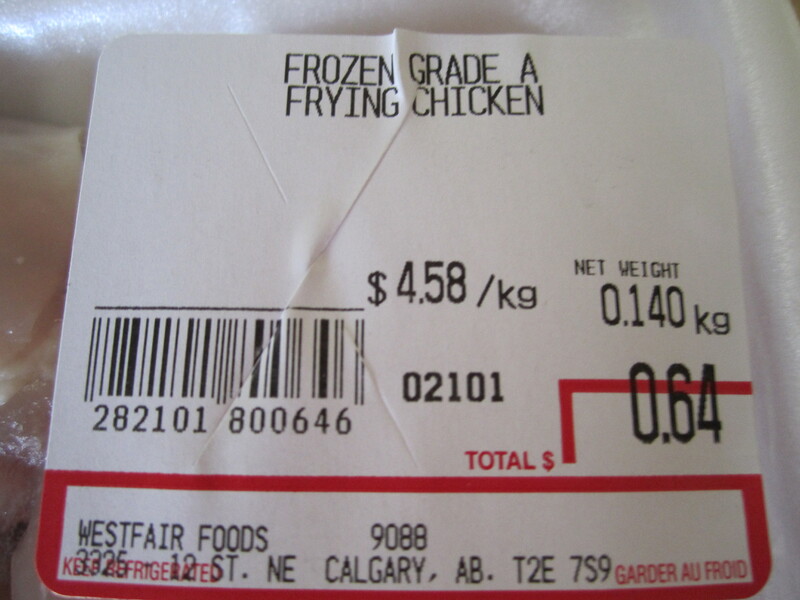 I bought twenty chicken thighs for sixty-four cents. In the days of (gulp) $1.29 a litre gas, I’m grateful for any deal that comes my way. I hope you are having a wonderful spring day. I’m going to barbeque some chicken and sit in the sunshine.